Sea otters are mammals that belong to the Mustelidae family along with weasles, badgers, and skunks. They are the only species of the genus Enhydra, however, there are three sub-species that can be distinguished by their fur color, and body size. These are the largest living member of the family Mustelidae, with the males weighing 22 to 45 kg, and the females 14 to 22 kg. The males are usually 1.2 to 1.5 m long while the females generally range from 1 to 1.4 m. their tail is generally less than 1/3 of their body length. Sea otter fur is the densest of all mammals, they have about 100,000 hairs per square centimeter. Their fur is generally brown or reddish brown and since they have no insulating fat, their fur has to give them body heat. Their back legs are long and the paws are broad, flat, and webbed. Sea otters reproduce sexually and are able to have offspring all year round. The main months of birth are from May to June in the Aleutian Islands and January through March in the California population. Delayed implantation produces varied gestation times. Pregnancy has been reported between 4 and 12 months long. On average females give birth once a year. Orientation of the fetus may be either caudal or cephalic, although cephalic orientation is more common near birth. Usually a single pup is born weighing from 1.4 to 2.3 kg. Twins are rare, occurring in 2% of births but only one pup can be raised successfully. Pups typically remain with their mother for 5 to 6 months after birth. Females that lose a pup will go into estrus sooner than if their pup had survived. Females reach sexual maturity at 4 years. Males reach sexual maturity at 5 to 6 years of age, but might not reproduce until much later. 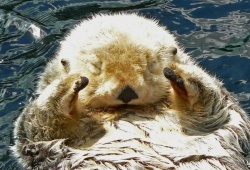 Habitat: Sea otters are marine mammals, meaning they inhabit temperate coastal waters. They live in both salt and fresh water (depending on the species). These animals generally inhabit rocky or soft sediment ocean bottoms, less than 1 km away from the shore. Kelp forest ecosystems are also characteristic of otter habitats. In the past sea otters have lived in the following places: Hokkaido Island of Japan north through the Kuril Islands and eastern coast of Kamchatka, east through the Commander Islands and Aleutian archipelago, the southern coast of Alaska, and the west coast of North America to Baja, Mexico. Sea ice limits their northern range to below 57 degrees N lattitude, and the distribution of kelp forests limits the southern range to about 22 degrees N lattitude. Due to hunting and environmental changes sea otters are only found in the following palces: E.l. lutris ranges from the Kuril Islands north to the commander islands in the western pacific. E.l. nereis is found off the coast of central California. E.l. kenyoni is distributed throughout the Aleutian Islands]] and southern Alaska, and has been reintroduced to various locations from south of Prince William Sound, Alaska to Oregon. Niche: Sea Otters are carnivorous creatures. They eat nearly any seafood they can scavenge in their kelp forests. Their diet consists mainly of marine invertebrate herbivores and filter feeders such as mussels, sea urchins (Strongylocentrotus sp. ), snails, and abalone. Otters also eat crabs, octopus, squid, sea stars, and fish. Individuals tend to be specialized in their choice of prey: one otter may consume only urchins and crabs while another will eat mostly fish, all depending on the abilities of the individual otter and what is available in the area. Otters need to consume 20% to 25% of their body weight each day. They get most of their water from prey but will also drink seawater when thirsty. This page was last modified on 1 February 2009, at 01:10.